Andre Harrison (@drethebull) is the reigning, defending, undisputed and undefeated Titan FC Featherweight Champion. As one of the top prospects in the sport, not signed to the UFC, he prepares for his next title defense next Friday Night at Titan FC 41 against Alexandre “Popo” Bezerra. Belal Muhammad (@bullyb170) is a UFC Welterweight coming off of a Fight of the Night Performance back in July at UFC Fight Night 90, International Fight Week, against Alan Jouban. He will take on Augusto Montaño on September 17th at UFC Fight Night in Hidalgo, TX. He also weighs in on his teammate CM Punk, as he prepares to take on Mickey Gall next weekend at UFC 203. 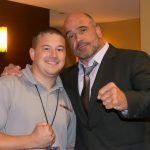 Speaking of CM Punk & Mickey Gall, they had their conference call earlier today, and Eric Kowal, the man behind MyMMANews.com (@mymmanews) was on the call. He joins us for the wrap up to talk about some of the interesting things that came out of it, plus some of the other big stories in the sport as well.